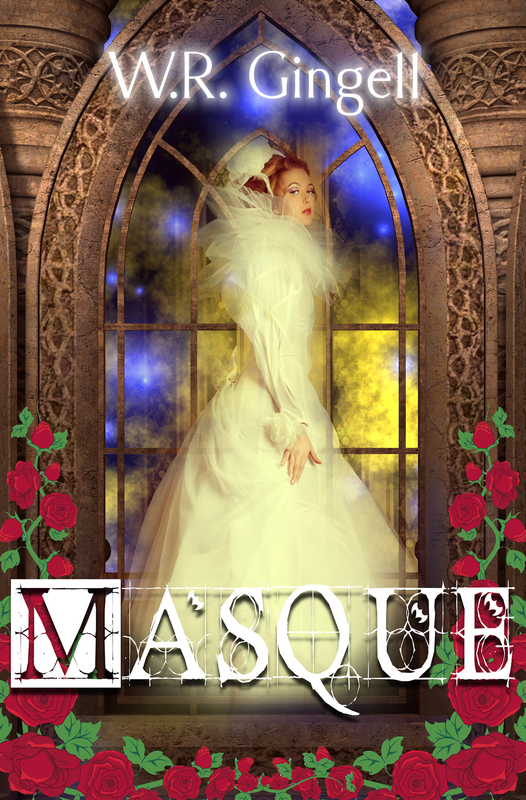 As Masque will be officially published tomorrow, I thought it was high time that I shared a sample of it here. Unlike Spindle, I haven’t used the very first pages: instead, I’ve cut an excerpt from somewhere in the middle of chapter one. Do enjoy, and don’t forget to order Masque tonight! It’s available in paperback and ebook formats from Amazon, Kobo, Createspace, and selected bookstores, and the preorder function is still on. Normal service will resume in a few days. Until then, enjoy! Excerpt from Masque Chapter One. The library was pleasantly quiet when I wandered idly back through it. Someone had lit a fire in the grate, and orangey shadows flickered over the walls, pearlescent and warm. A comfortable-looking settee was set back a little from the fire, big and plush and just right for reading in, and somehow I found myself sitting down. It was comfortable, and before I knew what I was doing I had slipped out of my dancing shoes and tucked my feet beneath me as I did at home on a rainy day. I was stretching back luxuriously with a guilty thought that I shouldn’t stay too long from the ballroom, when I realised with something of a shock that I was not alone. Green eyes gazed at me from an identical chair opposite mine, and a familiar green waistcoat glowed rich emerald in the firelight: it was the man I had danced with. His voice was velvet like his waistcoat, deep with slightly rough edges, but now that I had a chance to really look at him, I found that there was something unnerving in his face. He cocked his head and leaned a little forward. “Most people don’t notice me when I don’t want to be noticed.” He said it more with interest than annoyance. “I see,” I said quietly; and I did see. I saw two things: one, that this man was a magic user, and that was why I hadn’t seen him at first; and two, that my feeling of unease came from the fact that he was wearing a mask beneath a mask. The lips of it moved, but stiffly, and with imperfect synchronicity. What sort of a man wore a mask beneath a mask? He looked at me piercingly, and I added with mendacious helpfulness: “The one who stumbles.” I was enjoying myself immensely. I thought I saw a gleam of answering humour in Lord Pecus’s eyes, but it was difficult to tell through the magical mask. I was burning with curiosity that was tempered by a touch of self-satisfaction that I was about to accomplish something that even Delysia had not been able to accomplish, but I untied my mask with fingers that were steady enough. Lord Pecus sat silent for a moment as if in thought, his mask unreadable. If he had said it with the slightest theatricality, I would have laughed and gone back to the ballroom, content not to know what his face really looked like. But he said it unemotionally, a plain warning; and I had to take myself firmly to task for the quickly accelerating beat of my heart as he removed the charms that kept his mask in place. I settled my chin a little more firmly in my palm and waited, watching the process with some interest. I had not much talent for magic, and my knowledge was almost as slight: my training had mostly to do with international policy and diplomatic processes. At last he seemed to be done. He raised both hands to remove the mask – beautiful hands, strong and bare of rings – and it came away cleanly. For a moment I thought he had yet another mask beneath: firelight played on tawny brown hair – no, fur!- in a face that looked like the worst parts of wolf and bear mixed. I blinked once, realising in that instant that it was his face, his real face, and no mask. His mask must be magic indeed to have hidden that snout under the pretence of a plain common-or-garden human nose.